“I love collaborating with people,” says Julia Lierman, HR Generalist at Dugan & Meyers. Established in 1935, Dugan & Meyers has completed quality projects with integrity and professionalism for more than 80 years. Its reputation as a firm of professional constructors is further enhanced by pride in workmanship and excellence in every project. That love of collaboration is why Julia’s superpower is teamwork. “Personal or professional, throw me in with someone, and I can make it work,” she says. 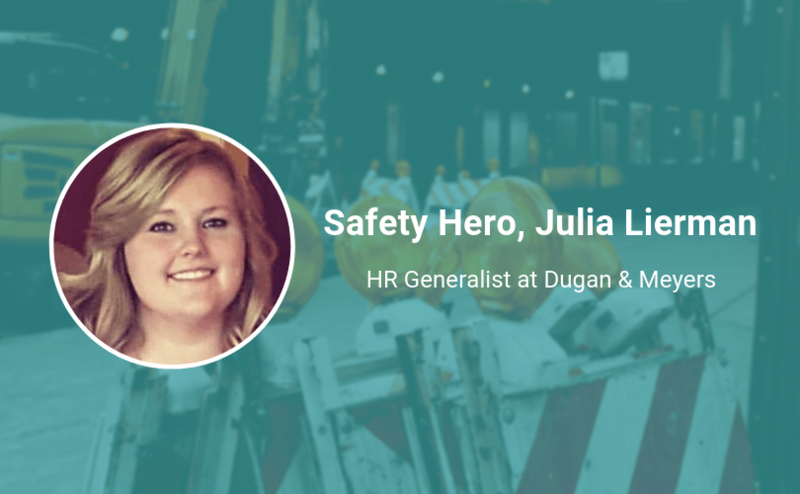 We spoke to Julia about the best piece of advice she’s ever gotten and her advice for someone starting out in a role that supports safety. Keep reading to hear her story and to learn why she thinks the future of safety will continue to be about proactivity and preventive measures. My first job post college graduation was working with a behavioral health organization. I helped those with severe and persistent mental illness become job ready and assisted in job placements. As those who work with the public know, you see a little bit of it all. Not only did I have to learn the true meaning of flexibility. If there is something that can go wrong, some person is bound to find it, you just must have patience and work with what you have. I graduated college, and after working in the social service realm, I was looking for a position that was more business professional to grow those skills. A family member told me about the position and everything fell into place. Food and family, need I say more? I enjoy trying and making new food and sharing those experiences with my friends and family. The best piece of advice I have ever gotten, is from my parents about relationships. Building relationships and support networks can really help you out of some sticky situations. So, take the time, do the little things and most of all be kind – it pays off. Details, details and more details. When you’re talking safety, health or even other related departments missing a small detail can make for big mistake later down the road. It helps to pause and re-check items, it may seem time consuming, but it really will save you trouble down the line. To never go into any situation with assumptions. Some of my most humbling moments have been when assumptions were made about an event or situation and details come around later that change everything we thought. The incident that changed my professional approach/ opinion, didn’t happen at work, but it is something that I reflect on. A close family friend almost lost a finger to a table saw at 17. He was doing something that his supervisor should have never allowed. This where I feel that safety is the duty of everyone. At 17, you think you’re tough and can take on the world, so you don’t stop and think that maybe you’re agreeing to tasks that aren’t in your best interest. Had he questioned why he was operating that equipment or had someone else stepped up, that injury would’ve never occurred. That everyone plays a role, just because you know something is unsafe, doesn’t mean everyone else does. I love this quote, because it goes along with the idea that actions will always speak louder than words. An ideal that I follow in my personal life and has been the foundation of my successes in professional settings. I would love to change stigma that some managers have that they extra precautions are a waste of time. I’ve run into several that don’t just see how working safely can be not only beneficial to the employee but can save the company a lot of time and money in the long run. It’s not a new challenge, but something that would speed up some processes. Currently in our company and in others, there is a push to improve our processes and to make them safer for everyone. I think you will continue to see a push in preventive programs and how best to meet employees at their level. Something a little less positive to think about, but something I think everyone is beginning to consider is workplace violence. I think that with the recent unfortunate events, management will have to really take a look at how we can be more proactive, so we can prevent these events or at least how we can decrease injuries. Wastren Advantage Inc. in Piketon, Ohio. I admire that they did not put financial restrictions on improving safety and that safety is the responsibility of everyone. Not to mention—I have to show some love to businesses in my home state.